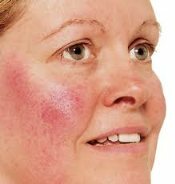 Rosacea is a genetic skin disorder believed to be caused by microbes living underneath the skin resulting in a bacterial infection in the bloodstream. It manifests itself in red, dry, flaky patches over the cheeks and nose that can be very painful. Several factors worsen rosacea: hot liquids, spicy foods, alcohol, sunlight, stress, extreme temperatures (such as hot tubs or saunas), smoking, or rubbing the skin. Soap is especially irritating for rosacea and should never be used on the face. Cetaphil or similar mild unscented cleanser is safe for sensitive skin and is recommended by most doctors. Prescription medications such as Metro Gel, Metro Cream, Azelaic Acid, Noritate, Finacea or oral anti-biotics such as tetracycline seem to lessen the symptoms and sometimes clear up rosacea. The downside is the antibiotics compromise the immune system and disturb digestion. Some have found relief from salicylic acid treatments or photoderm lasers (same ones used to remove spider veins from legs) which can remove rosacea permanently. Gentle skin care products: cleansers, soothing toners with anti-irritants, lightweight moisturizers, and nonchemical sunscreens (zinc oxide or titanium dioxide) are the basics for dealing with rosacea. Due to it's anti-inflammatory action, Emu Oil is very effective in relieving the redness and itching of rosacea. Apply Pure Emu Oil three to four times a day for the first two weeks, then routinely morning and night to prevent reappearance of symptoms.